Bring out the beauty of your home with incredible landscape design from Fallas Landscape. We take the time to work with you and decide on a plan that will highlight the natural beauty of your home. A good landscape design will draw the eyes of people passing by; a great landscape design will set your home apart and showcase your unique style. At Fallas Landscape, we specialize in great landscaping, so let us help you bring your vision to life. Fallas Landscape takes the time and effort to make sure your landscape design is perfectly suited to your unique wants and needs. 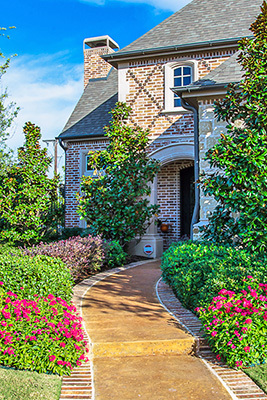 Let your home’s personality and beauty shine through with breathtaking landscape design. After your landscaping is done we also offer landscaping maintenance services to keep your landscaping as beautiful as the day we put it in. We also build outdoor living spaces, pools, aquatic features, patios, fences, outdoor kitchens, and provide lawn maintenance. We offer free estimates for all our services, so contact us today to start putting your plans in motion. We look forward to making your plans a reality! There are quite a few factors in the planning stage of your landscape design. First, you should decide what your budget is. This can help inform the rest of the process. After that, we can start considering what kind of features you want. This is when we start planning where your plants and trees will be located, what color palette you’d like, if you want any water or stone features, and other decisions. This preliminary plan will define the final product and will allow us to make an accurate price estimate for you. We’ll work with you and guide you during this stage to figure out your vision. We love creative challenges, so we look forward to seeing what you come up with. After the preliminary steps, we can begin making your plans happen. A beautiful landscape can bring you satisfaction and happiness. Imagine sitting in your backyard in the springtime, surrounded by flowering plants and greenery. The peace and relaxation it can bring you is more than worth it. It will also greatly increase the curb appeal of your home. People will be able to get an idea of your style and vision when they pass by.